Information On How To Submit A Fan Panel Can Be Found Here. Do you have a particular passion for a very specific aspect of fandom? Do you have a particular TV show such as “Supernatural” or “Firefly” that especially excites you? Do you consider “Rick and Morty” to be as deep and meaningful as Shakespeare and desire to prove it? Do you feel Janeway is the best Star Trek captain and wish to prove it? Maybe you’re an independent or aspiring artist and desire to share great wisdom about your future profession? And would you like the opportunity to speak about it in front of other die-hard fans of the same ilk? If so, we have the opportunity for you! 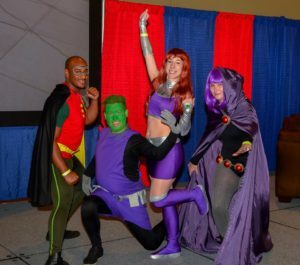 The Grand Rapids Comic-Con is currently searching for fans such as yourself to operate a fan-based panel in one of the programming rooms at the show on November 9-11 at the DeVos Place. If approved, you would get time in the schedule in one of our programming rooms to present your wisdom in front of a crowd during the event. Plus, we’ll pay you $20 for each approved and completed presentation! The deadline for submission of September 14, so get those panels in now! What Is A “Fan Panel” Anyway? 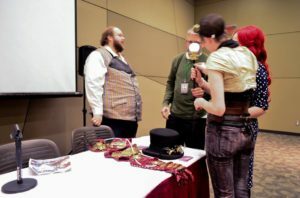 Fan panels are seminars, presentations, and or/lectures held at comic book and other popular arts conventions presented by patrons from the fan community rather than an artist, literary or media guest. These are panels that come from a more fan-based perspective rather than a professional one and may not be as polished but exudes a passion for the topic discussed. Fan panels at conventions are as old as the popular arts convention itself and can be first traced back to the original science fiction gatherings as early as 1947. Today, fan panels are just as popular as ever and are presented at all types of popular arts conventions but especially at anime and more traditional science fiction events as well as shows hosted at colleges. The Grand Rapids Comic-Con is proud to continue the tradition of fan panels and have saved a decent amount of hours in our programming rooms for panels that are created by the fan base. These panels will be a part of the schedule and will be advertised like any other panel at the show, and presenters will be listed on the Speakers and Moderators page. Each fan panel will also have professional visual and audio equipment with knowledgeable technicians available in case of a problem.